With so many styles and designs available for men today, there are a lot more questions to ask when choosing your Wedding Ring. To help we at Diamond Heaven have come up with 3 tips for you to consider when purchasing a Men's Wedding Ring. 1. To match or not to match? That is the question on the lips of many couples who are preparing for wedlock. The decision on whether or not to have matching wedding rings amongst couples is increasingly growing in popularity and it is clear to see why. Not only can men find a wedding ring style which is sleek and stylish and at the same time perfectly matches your loved ones personality and lifestyle. This can be a truly beautiful gesture and is the perfect declaration of your loving relationship. Rather than going for an exact match of your partner's ring, it may be a good idea to either match the metal, stone or the finish, as you will no doubt want a wedding ring which is unique and adds a touch of individuality in your chosen ring design. Deciding on your wedding ring metal is a very important factor when making your final decision. Not only can it influence the way it looks, but it can also determine the price, maintenance and care the needed for the ring. So it's always good to do a little bit of background research or booking a free consultation with us, before you make this important decision. We briefly touched on the fact that couples may want to choose matching or contrasting wedding rings. So, before you make the final decision make sure you sit down and discuss the different metals that you both have in mind. The most popular wedding ring metals amongst men has to be Platinum. Masculine, bold and impressive, these are just a few words to perfectly sum up a platinum wedding ring. By choosing a platinum wedding ring you are guaranteed a ring that will stand the test of time. One of the most popular features of the platinum wedding ring is the heaviness of the platinum metal boasts a soft, satin-like finish to the ring. Our 8mm Court Shape Wedding Ring is the perfect example of the vastly popular and sought after wedding bands there is available. The larger set ring creates a bold and sleek design, which makes this particular style the perfect choice for someone who is looking for a truly traditional, yet stand out ring. Extremely popular amongst grooms and a member of the platinum family. Palladium metal is one of the most sought after metals available for wedding rings. This particular metal delivers a classy shine, to both grey and yellow coloured designs, which can be hard to come by amongst other metals. Our 6mm Court Milgrain Wedding Ring is the perfect example of a modern twist to a classic wedding ring design & with a stand out shining finish this particular piece is perfect for someone who is looking to turn a few heads. With similar qualities to platinum such as: resistance to corrosion, hypoallergenic properties and consistent shine - this particular metal won't just save you some money but it is also highly durable, making a truly long lasting and timeless piece. Choosing Gold metal for your men's wedding ring can be the perfect alternative to modern day designs and makes for a truly classic piece. Gold metal is one of the most popular and timeless choices there is available. It has played a major role in cultural and religious ceremonies for many centuries, making it a very popular metal to have. We have a very stylish 8mm Flat Court Wedding Ring which truly represents the perfect gold wedding ring and makes for a very traditional, yet elegant piece to have. One of the main benefits of choosing a gold wedding ring is the option to have gold metal in a variety of colours. With the options of 18ct White Gold, 18ct Rose Gold or even the combination of two metals like the 18ct Yellow/White Gold Metals we have available, we are sure you will find the perfect metal for you or your loved one. 3. Diamond or Plain Wedding Rings? With the vast range of wedding rings available for men one of the main considerations during the buying process is to either choose a diamond or plain wedding ring. It's becoming increasingly popular for men to wear wedding rings with diamonds rather than choosing a plain and subtle design, as the diamond alternative looks very stylish and makes for a truly eye catching piece. Take our 5mm Round Diamond Wedding Ring as an example of a diamond wedding ring. The subtle, yet eye catching centered stone is wrapped by a sophisticated gold metal, which would perfectly compliment any man's style. This particular design combines both the thicker traditional wedding band along with a subtle, yet dashing diamond setting in the ring. This is just one of the elegant wedding ring designs we have available for men which are accompanied with handcrafted metals and customised diamond cuts. The classic wedding band design will surely be amongst us for years to come and the demand for this style hasn't lost popularity amongst men, as most men want a ring which is simplistic and isn't too over the top. 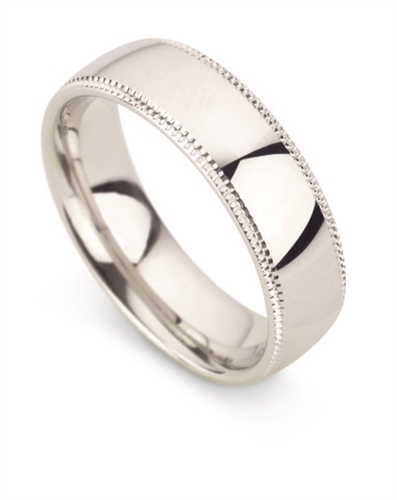 Our 5mm Flat Court Wedding Ring is the perfect representation of the traditional plain wedding ring design amongst men. The larger flat court profile allows for customisation to the durable metal with the option to have a personalised message in the ring, which can be a personal and loving message or a significant date to you and your loved one, making it a perfect symbol of your love for each other. We hope this post has helped you decide on which wedding ring is perfect for you or your groom to compliment their lifestyle and image. If you have decided on a particular style of a wedding ring, then please take a look at our brilliant selection of either Diamond or Plain Men's Wedding Rings we have available. If you still need a little inspiration and you are in a bit of a dilemma, then feel free to get in touch with us today for a free consultation.